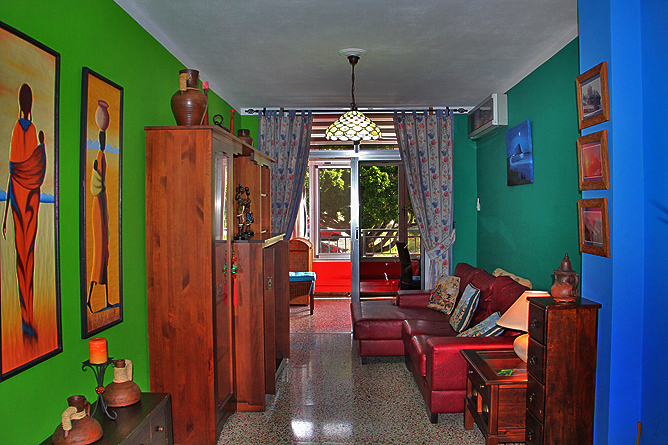 The Holiday Apartment Rosy is located on the first floor of an apartment house in Puerto Naos. The house is in a side road offers a central location. 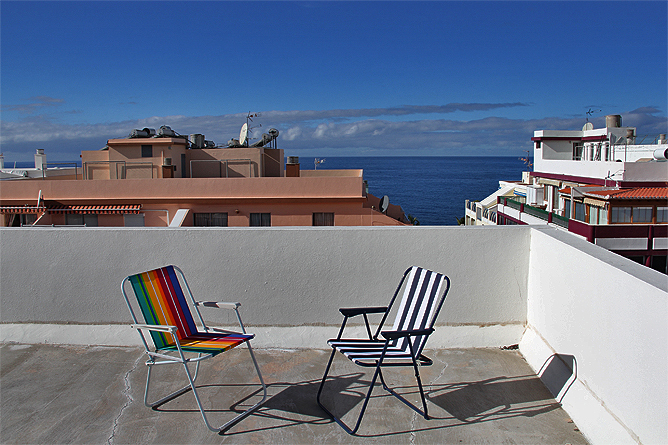 You enjoy a fantastic sea view from the roof terrace. 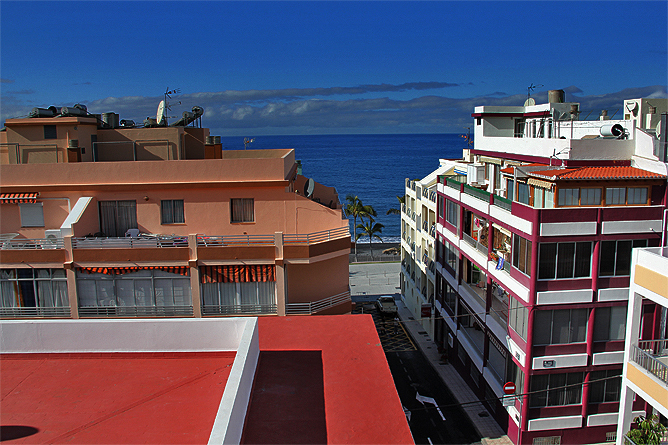 The wide black sandy beach of Puerto Naos is only a few steps from the Holiday Apartment Rosy. A beautiful, newly designed promenade invites you after a day on the beach to stroll along and visit one of the lovely cafés. 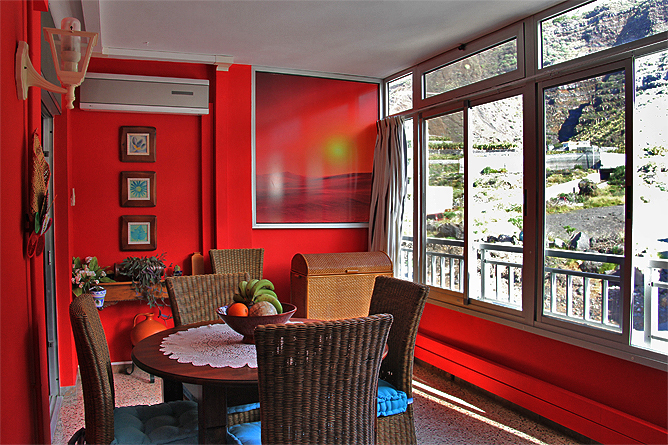 The 74m² Holiday Apartment Rosy has been colourfully designed by its landlady. The winter garden features a beautiful mountain view. The sliding doors of the panorama glass front can be opened, so that the room becomes a balcony area. 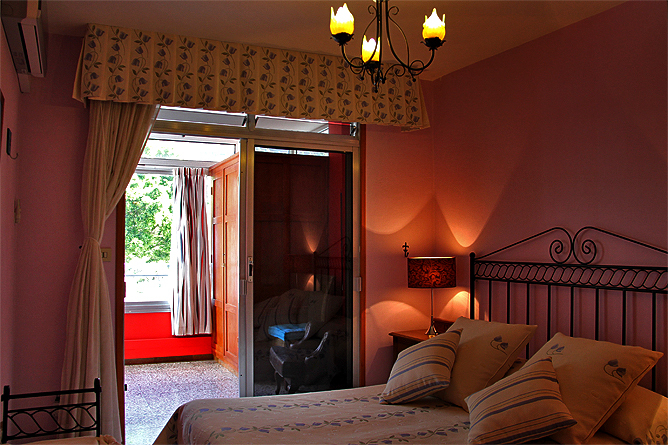 The room is furnished with a large dining table and there is also a cosy reading corner. An air condition/heating system provides pleasant room temperatures year-round. The living room and the kitchen are separated by a sliding door from the bathroom, the bedroom and the dressing room. The winter garden is accessible from the living room as well as from the bedroom. 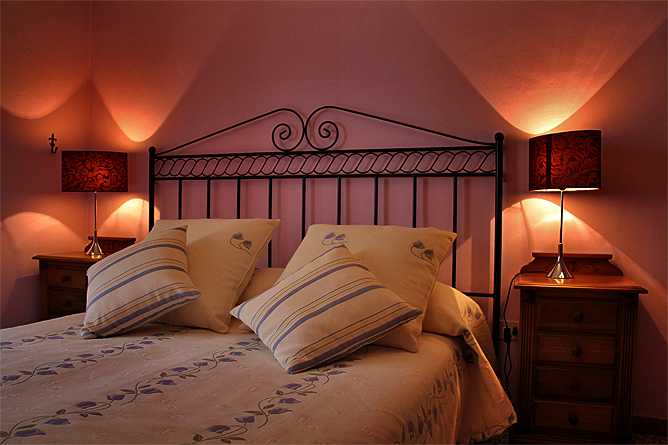 The bedroom is furnished with a double bed. New quality latex mattresses ensure a restful sleep. 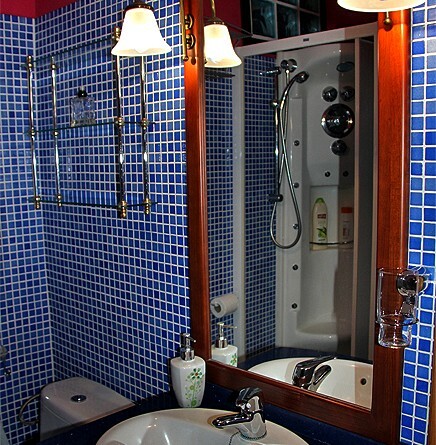 The separate dressing room has a large mirror cabinet with plenty of space, also for an extended stay. 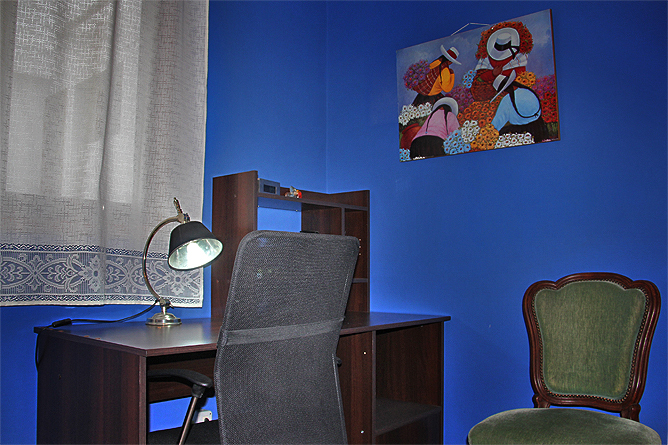 There is also a small desk in the bedroom. The window faces the patio. 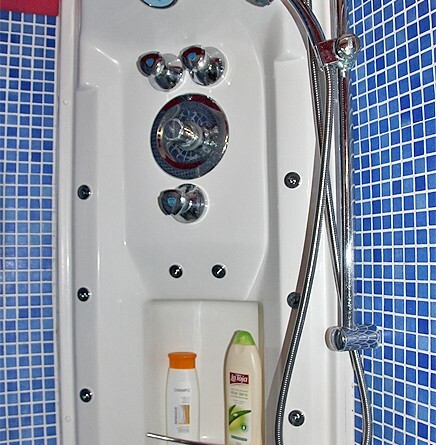 The small bathroom features a shower cabin with massage jets. 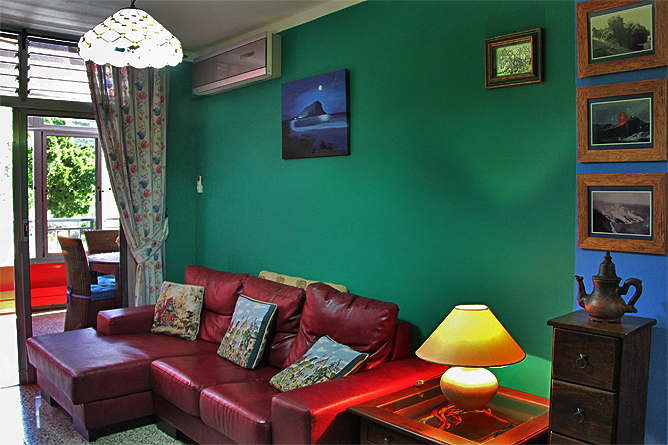 The living room is painted in a vibrant green colour and contrasts with the red leather sofa and the dark stylish furniture. 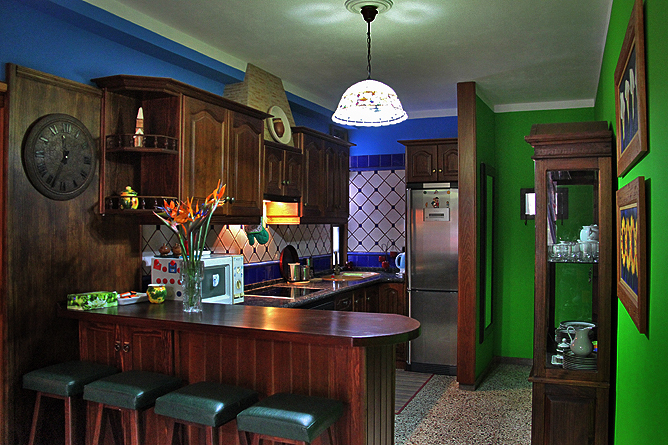 The kitchen is slightly separated from the living room and well equipped. 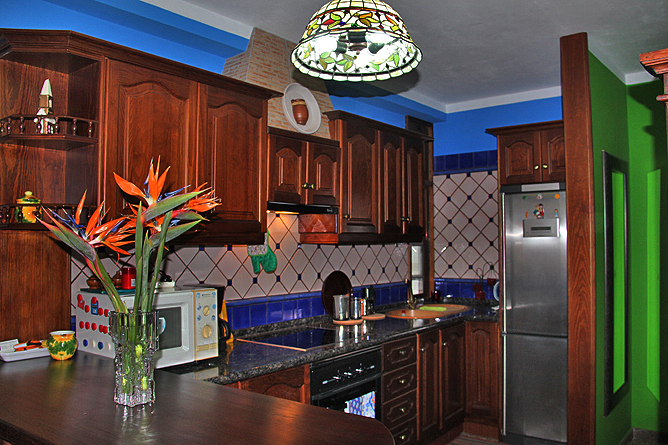 Crockery and kitchen utensils are stored in the kitchen cabinets and in the beautiful display case. 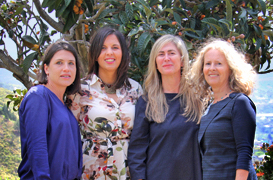 In Puerto Naos there are several good restaurants, stores, supermarkets and different kinds of sport activities offered like hiking, biking, paragliding or diving. The bus stop is only 5 minutes from the Holiday Apartment. Busses to Los Llanos depart every half hour. 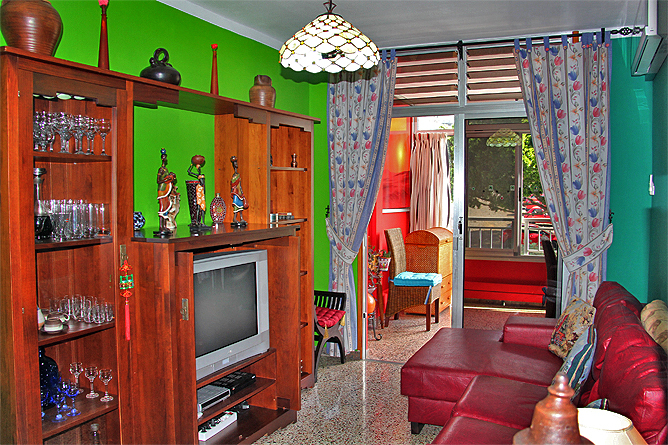 Holiday Apartment with colourful Interior and Winter Garden.